The 1586 Colloquy of Montbéliard should not have been forgotten. Here we see what the real issues were between classic Lutheranism and classic Calvinism. This was a formal religious colloquy, a discussion of difference in religion between the leading Lutheran and Reformed churchmen of the day: Jakob Andreae (1528–1590) and Theodore Beza (1519–1605). Princes and noblemen attended. Chancellors gave orations. But it really came down to two men talking about the most important things of all: God, the saving will of God, Jesus Christ, and the mysterious, gracious presence of Christ in the sacraments. Here there are speeches, summaries, position papers, replies, reasons. The selection below discusses the reformation of Temples, Images, and Organs. Christians of the sixteenth century commonly called their church buildings “temples,” because they are the places where God dwells through the means of grace, and in which His people gather to praise Him and receive His grace. Here the Lutherans and Reformed discuss worship, with its music, art, and architecture. If the worship of the saints occurred in church buildings inherited from the Middle Ages, what must be done to make it a place fit for Evangelical (Gospel-centered) worship? Here both sides take seriously the locational holiness that must befit Christian worship; Christianity and its worship is corporate and located in places. But how radical does the break from Catholic antiquity have to be? The differences between Lutheranism and Calvinism were, and are, real and important, but this Colloquy also shows where the two sides agreed. In order to avoid mischaracterizing classic, confessional Lutheranism and Calvinism, the Colloquy of Montbéliard should be required reading. Fill out the form below to download a free selection from Lutheranism vs. Calvinism. This book will be available for purchase on October 31, 2017. 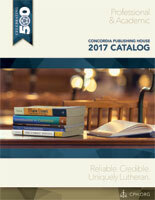 Featuring detailed biographical sketches and first-time English translations of some of the most well-known and respected writings from the era of Lutheran Orthodoxy (1580–1700), Lives and Writings of the Great Fathers of the Lutheran Church offers today’s readers a treasure chest of knowledge and insight into the great teachers and their writings from this oft-forgotten and misunderstood era of the Lutheran Church. The following was excerpted from Gerhard Bode’s chapter, in which he offers a thoughtful and comprehensive biography of Lutheran educator and pastor Conrad Dieterich (1575–1639), a man best known for his educational and catechetical writings, as well as a select translation of Dieterich’s Catechismus Predigt. With overflowing joy, the Church of Jesus Christ celebrates the Feast of All Saints’ Day. The Feast of All Saints’ is one of the principal feasts of Christ. Many congregations observe the custom of transferring it to the first Sunday in November each year so that a maximal number of people may join in its joyful celebration.